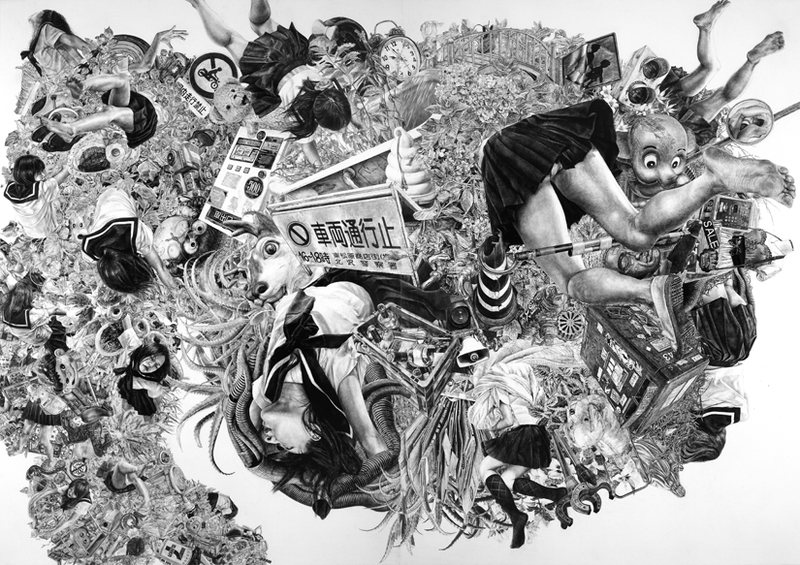 We are pleased to announce KUMAZAWA Mikiko first solo exhibition at Mizuma Action with a body of new and old pencil drawing. She was born in Aichi prefecture in 1983 and graduated from Musashino Art University with master’s degree in 2008. At the same year, she was awarded the “Hisho” Setagaya Art Award. Her exhibition at Citizen’s Gallery in Setagaya Art Museum that came with the award was highly appreciated. The large screen is filled up with crowded town and people. Elaborate depiction by pencil predominantly covers the whole surface and its overfull energy swallows the reality. The town, train and expression of people are detailed and each character is drawn accurately and carefully more than you think necessary. Though in reality, the impression of her work is insistent more than comic or computer graphics where the reality is deformed. Today, comic and computer graphics are common as the basic device which effortlessly leads us to parallel universe. When you see the unbelievable scene in animation or movie, we can easily accept or comprehend. On the other hand, works by Kumazawa show us unrealistic world without the signs of deformation or simplification. Therefore, when we stand in front of Kumawaza’s works, we feel a strong shock as if our daily life changes its shape to unreal one while the split second of blinking. Due to strong impression of the world she creates, it might look like it is an artifact of conceit at first glance, but in detail, you will realize that it is still a real world with a hint of change in rule. The aim of Kumazawa is not to depict a sight of imaginable world but to capture our familiar world by the different method. For this reason, it can be said that her works focuses more real image than our retina can. There are thousand of worlds and stories in a piece of works. We hope that you will see the bloom of new talent who cut and tie the world in every direction.